Veracity Learning is a simple yet powerful tool for collecting Experience API (xAPI) statements . We fully support all types of xAPI data, including statement signatures, binary attachments, and document stores. Veracity Learning includes powerful graphing and reporting tools to visualize data and detect trends. You'll gain valuable insights from your first statement with our special support for common xAPI profiles. Not only do we receive xAPI statements, we can also host the content that generates them! Veracity Learning includes file hosting, xAPI Launch support, and learner account management. We're serious about taking learning data to scale. Veracity Learning is designed to store hundreds of millions of xAPI statements, and tens of thousands of API calls per second. Robust analytics and multiple dashboard interfaces for learners and instructors. Embed reports in other applications for real time insights, or build custom dashboards on your own site. Veracity Learning can take over some of your basic LMS use cases. We allow you to create learner accounts, upload lessons and content packages, and create a basic learner portal. Extracting data from a Learning Record Store can be a pain. Veracity Learning exposes the standard xAPI search interface, a much more powerful statement search API, plus an aggregation API for complex metrics. It's your data, use it however you want! We can export results to JSON, create entire binary database exports, or ingest xAPI data from other sources. You can even build complex hierarchies of LRSs using Statement Forwarding. Your account can create separate LRS instances for different testing environments or data integration strategies. Options for Cloud-Hosted or Onsite installation. Our cloud system is available anywhere, and our onsite software can run on any OS. Installation can be as easy as a single click, or scale up to a massive multi-node cluster. Each visualization from our analytics tools can be exported as a live graph. This graph can be embedded into other sites. 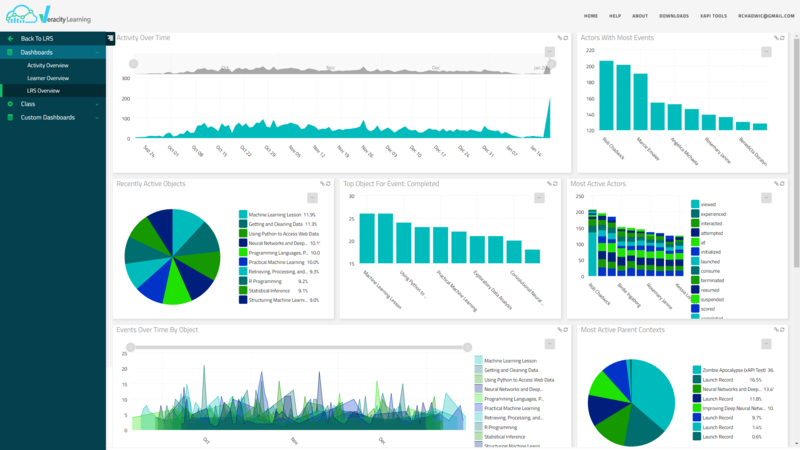 Mix and match our visualizations to build a custom dashboard, or post them to forums and blogs. Below, you see some real time visualization of data in our test LRS! 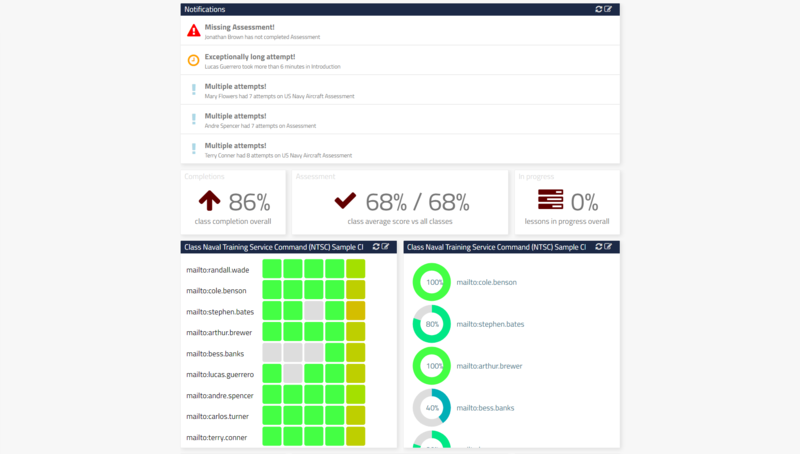 Veracity Learning provides a set of dashboards that are based on the SCORM Profile. Statements following the SCORM Profile will automatically be used in graphs designed for SCORM-like interactions and progress. Veracity Learning is the foundation for a variety of tools and services. Ask us about developing customized data visualizations and dashboards. We can also build versions with Single Sign On support, EHRI data import, or direct LMS integration. Contact us about data collection and visualization for non-xAPI data sources as well! The Experience API field uses a lot of acronyms for new technologies. Don't worry, we're here to help. Here's some quick info to help this all make sense. As always, contact us with questions! To keep up with trends in the xAPI world, follow our development, or read articles about learning data, check out our blog! Short for "Learning Record Store"
In the xAPI world, an LRS ( Learning Record Store ) is a database that accepts "xAPI Statements" . The specificiation defines a standard way that an LRS must accept and publish publish statements. When your content uses xAPI, you can connect it to any conformant LRS. The eXperience API ( xAPI ) is a standard for transporting learning performance data. This standard uses modern web principles to collect data from different types of sources. Most xAPI data is a "Statement" , which is a formal way of saying "Someone did something"
Now that you're using xAPI to record data to an LRS, how do you configure your website to talk to YOUR LRS, instead of someone else's? xAPI Launch is a method for moving the web address and access codes for an LRS to another website, mobile app, or program. xapiapps is the learning experience platform built on xAPI. Use the apps you love to deliver measurable learning experiences.